The Android port of MolPrime is getting very close to being ready for a 1.0 release. The port from iOS (Objective C) to Android (Java) has been underway for some weeks now, and most of the functionality is fully operational. Previous posts (1, 2) have tracked early progress. Porting the underlying cheminformatics libraries necessary for displaying chemical structures makes progress look faster than it is, since there is so much more complex machinery under the hood, e.g. the template fusion algorithms that make drawing presentation-quality structures on a pocket sized device viable in the first place. The app is currently being tested on a Google Nexus 7 tablet, which is an impressive device (maybe not quite as polished as the #1 competition, but not far off, and has a lot of nerd-friendly advantages). Using a physical device for development is much faster and far superior to using the simulator, which is the opposite of other platforms such as BlackBerry & iOS. 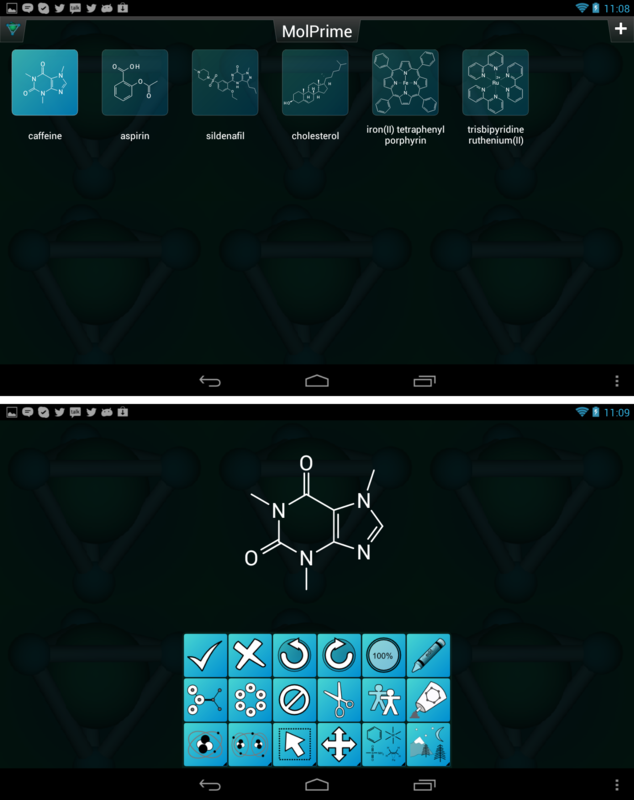 The Android MolPrime app is a feature mix of the MolPrime and MolPrime+ apps for iOS: it provides the ability to manage a small collection of molecular structures, which can be drawn or imported from other sources. The 1.0 minimum viable product will most likely be released with minimal options for exporting and graphics creation, but these will be fed in with subsequent updates. The app will be made available for free. The plan is to release it first on Google Play, which serves most Android devices. Because the API level is targeted at a relatively retro 2.3, it will be possible to make it available for non-mainstream Android devices, in particular the BlackBerry PlayBook and Amazon Kindle. For anyone who is attending the American Chemical Society meeting in Philadelphia in a couple of weeks, I will be bringing my Android tablet with me to demo the app to anyone who is interested. If you want to see it in real life before it is ready to go out to the public, find me at either one of my talks (Sunday and Monday: see the home page for specifics), or try stalking one of the CINF or COMP tracks.